Nevertheless she passed her degree with distinction in 2014. “It really helped to stimulate my brain. I hadn’t done exams since 1993,” she said. 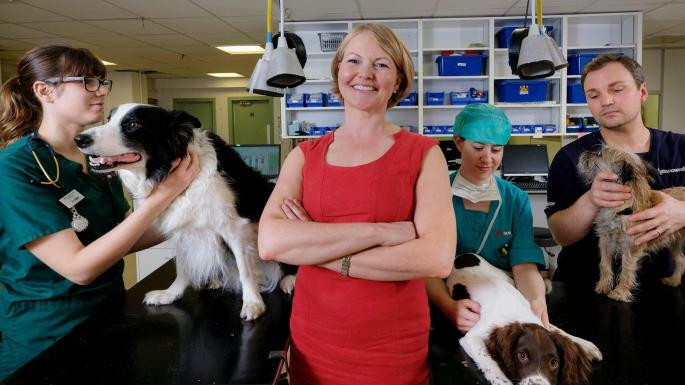 Today Colville, 47, is business development director of fast-expanding Vets Now, which is expected to turn over more than £41m this year with three 24/7 sites and 55 out-of-hours clinics. “It opened up the opportunity to enable me to take on this role – and for Vets Now to have the confidence in me to do it,” said Colville. Aberdeen Business School offers two AMBA-accredited MBAs: a general MBA and an oil and gas management MBA, delivered full-time, part-time and online. “I’m a geophysicist but I have been doing a lot more commercial work in my job. So I decided I would like to learn more about business. It’s been hard. They expect a lot from you. There’s a lot of camaraderie. I hope I will graduate with better prospects.” Joanne Cranswick (MBA, 2019). The University of Aberdeen offers two full-time and part-time MBAs, one of which focuses on energy management, plus an online variant. There are also plans to teach an executive MBA from January in London. “It was well tailored to giving me a good understanding of what it takes to be a successful manager in the energy industry. Getting introduced to financial theory, balance sheets and income statements was a great way to see the impact of fluctuating oil and gas prices on my company. There was a lot of emphasis on the softer skills. I became a manager of a team while I was doing it, which felt like a validation of the course I was doing.” Babak Alnasser (MBA energy management, 2016). Edinburgh Business School, the graduate school of business at Heriot-Watt University, has been a provider of distance-learning MBAs for more than 25 years. Under a new dean, it has introduced an on-campus full-time MBA starting this year, which will include a six-week study seminar to Dubai. “My first degree was in engineering and my work was very technical as an aircraft engineering manager. I began looking for an MBA in the early 1990s and found that the Edinburgh Business School course was the only credible distance learning course that fitted my needs. From the very start the MBA enabled me to see the bigger picture, from management to marketing, branding to finance. Without these skills there is no way that I could have launched a successful commercial operation.” Mark Pierotti (MBA, 1998). Edinburgh Napier offers a number of options to pursue an MBA: through full-time or part-time (executive) study and with full-time specialism in leadership practice. The university also delivers a series of variants with special pathways ranging from banking to tourism and hospitality, all through online learning. The University of Edinburgh offers a full-time MBA, a full-time MBA with an overseas exchange of two to three months and an executive MBA over two years. The programmes are AMBA, EQUIS and AACSB accredited. “With a clear emphasis on strategic leadership, and at the heart of one of Britain’s most dynamic cities, our school delivers a boutique experience. We work with small cohorts on a personalised programme where professional development sits at the heart of the experience. Our graduates leave with an ability to lead teams, a stellar professional network and a solid education delivered by a top faculty. “The highlight for me was the international diversity of the cohort. I have learnt a huge amount from my colleagues from all over the world. That layer upon learning the core business skills has been great. I have a lot of business experience but now I now have a much better perspective on why a company does things in certain ways.” Elwyn McLachan (MBA, 2017). The MBA programme at Glasgow University has been celebrating its 40th anniversary this year. Accredited by AMBA, EQUIS and AACSB, the programme is intended to teach students to think critically. “The international nature of the cohort was best of all, with 35 students with 20 different nationalities. It was amazing. You get to learn from everyone and learn to see things from different perspectives. In the consulting week we got to work with clients, preparing business plans and presenting them, putting theory into practice.” Elsa Germanos (MBA 2017). The Strathclyde MBA, which is accredited by AMBA, EQUIS and AACSB, is available in a variety of ways and a great deal of flexibility: full-time (in Glasgow); part-time (in Glasgow); through flexible learning; and as the Strathclyde Executive MBA at eight centres around the world. “It was tough after working to go back to university but the content was really practical; there were real examples that I could identify with from my previous experience.” Natalia Planillo (MBA, 2014). The University of the West of Scotland delivers full-time and part-time MBAs from its Lanarkshire campus, London and through distance learning. A move to brand new accommodation in a science park in south Lanarkshire is on the cards for next year. The distance learning option can be taken over a maximum of five years. The UWS MBA has also been recently mapped and accredited by the CMI. “It doesn’t matter what sort of business you work with after your MBA because you have gained a general knowledge. You have the basics and can cope with almost anything.” Francesco Loretucci (MBA, 2014). Stirling offers a full-time AMBA-accredited MBA that focuses on the practices, processes and outcomes of managing. Also accredited by the CMI. “The personal and professional development side allowed me to realise my own strengths and weaknesses, and be critical of my own performance. In all, it provided me with a better realisation of myself and other people.” Chris Champion (MBA, 2017). Bangor University offers a full-time MBA with 10 pathways and a new chartered banker MBA offered primarily online, with autumn and spring starts. “One of the things that galvanised me was the access to local and national businesses. When we were looking at strategy and the environment, we were thrown in at the deep end with local businesses, applying what we learnt in class to real life.” Rhodri Morgan (MBA environmental management, 2013). Cardiff delivers a full-time and an executive MBA, along with an MBA in media management in association with the school of journalism, media and cultural studies. The MBA is international in design, delivery and cohort make-up and turns theory into practice. “It was a very good learning experience; not just slides and textbooks but an exposure to experts and business leaders. My colleagues were senior managers who brought experience to the course.” Madhumohan Gopalan (executive MBA, 2017). The school offers a full-time and an executive MBA from a purpose-built building on its Llandaff campus. The full-time course includes Islamic finance as one of the six pathways. The executive MBA is accredited by the CMI. “I did the MBA after 20 years as a mechanical engineer to underpin my experience. In my final project I managed to combine my technical background with my newfound knowledge to develop performance evaluation for product design. I was one of the few UK students but the diverse cohort really opened up my mind to new ideas.” Adam Richards (MBA 2017). The school offers one full-time programme with a focus on ethical management and entrepreneurship from a brand new purpose-built building on the Treforest campus, with starting dates in September and January. “My organisation promoted me to director and wanted me to have the tools for the job — and that’s what the MBA provided. It wasn’t like being taught, it was much more about facilitating my learning. After three months, being able to look at a balance sheet and analyse it was brilliant.” Rhys Evans (MBA 2010). Queen’s offers one full-time international MBA with a focus on business engagement and leadership and skills at its Riddel Hall campus. In line with the school’s strong financial reputation, there is a trading room with access to Bloomberg terminals. “It’s very involved with the community, so there are a lot of chances to meet business people and build a network. Having only a few people on the course makes it a lot easier to know them and get personal attention from the lecturers.” Megan Van Portfliet (MBA 2015). The MBA courses are taught at the Jordanstown campus near Belfast and at Derry. Two years’ work experience usually required. CMI accredited. “I have learnt a lot in terms of pushing out my knowledge. it has definitely helped me in terms of widening my skills set. It is about getting outside your comfort zone. It is set in the practical world.” Richard McIlwaine (MBA 2015).